Over the past 5 years we have donated $10,000 to Hospice Prince Edward, $8,000 to the ROC, $5,000 to PECMH Foundation, $4,000 to Pr. Ed. Relay for Life, $1,000 to The Regent Theatre, $1,000 to County FM, $4,750 to Reaching for Rainbows, $2,000 to Gilead fellowship Christmas Dinners, $7,500 to Pr. Ed. 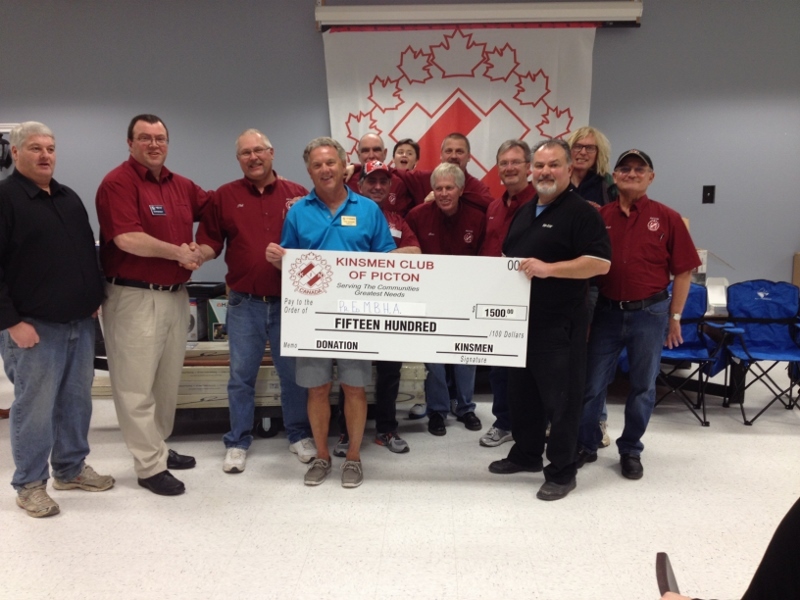 Minor Ball Hockey, $12,000 to CAS Angel Tree, $7,500 to Picton Air Cadets to name just a few. Over the last 5 years, through our combined fundraising efforts, our association has contributed over $ 120 000 supporting many worthy causes, youth groups, sporting and recreational groups, and county residents in times of need. We provide a $1,000 PECI student scholarship and a scholarship program for children of active Kinsmen going on to college or university. Thank you for helping us to make The County a better place to live.